Welcome to Builtrite Roofing and Structural Company, Manufacturer and Service Provider of Roofing Products. The company was incepted in 2013 at Chennai. Good financial position and Sound industry network helps us to grab maximum customer satisfaction. We are backed by Assured quality products, Competitive pricing policy and Excellent after sales support. We offer a vast range of Erection Services, Pre Engineering Building and Industrial Storage Solutions. Cement Tile Roof, Roofing and Decking Sheets are superior in performance. We also provide Crimp Roofing, Multi Color and Insulation Sheets that are widely acclaimed in the market. 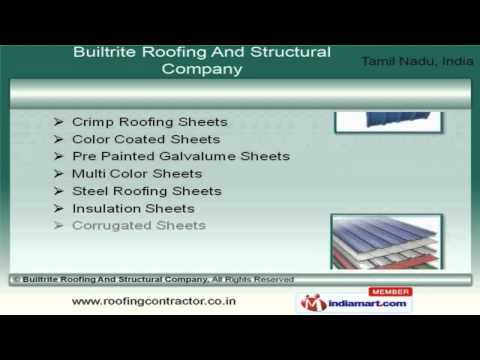 We are engaged in offering supreme quality Roofing Profile Sheets, Galvanized Coils and Insulation Materials. We have gained tremendous expertise in providing Tiger Steel Roofing, Turbo Air Ventilator and Industrial Exhaust Fans. Our Industrial Shed, Roofing Accessories and Box Type Louvers are well known for their durability.